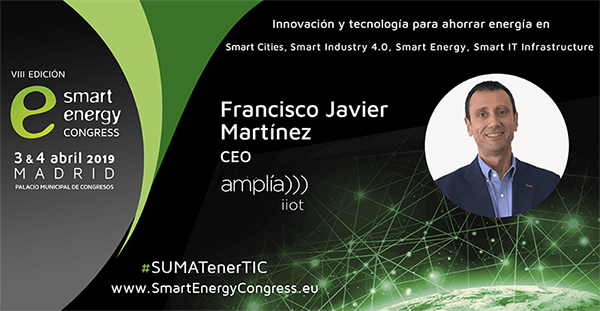 Our CEO, Francisco Javier Martínez-Abarca will be present at Smart Energy Congress in the Innovation and Technology session at 11.00 am 4 April with the talk “Efficiency and Optimization in the business processes thanks to IoT”. In this talk, Francisco Javier will speak about how energy companies have adopted IoT technologies in the Smart Grids to adaptation to the European Current Law and how have obtained advantages both economic by the operative costs reduction as well as competitive due to optimising the service quality. The congress takes place at the Palacio Municipal de Congreso in Madrid from 3 to 4 April. An event turned into a leader of Energy Industry for its struggle to make aware from institutions, associations, councils, companies and professionals to boost Energy Efficiency and Sustainability for a better society. If you are attending the Smart Energy Congress, it would be fine to meet you there. Let’s make an appointment! Send us and email with your availability. See you at Smart Energy Congress!